When we started A2L in 1995, our focus was on educating the legal market about the value of using visual aids in courtroom presentations. It may seem hard to believe now, but twenty years ago, most people did not believe visuals aids would help much with a jury. As one partner famously said to me in a Paper Chase-esque voice, "I went to Harvard and Yale, I'm pretty sure people understand me when I speak." Since then, the vast majority of litigators have come to realize that the litigation graphics used in courtroom presentations are not used to make up for poor communications. Rather, these visual aids, in the form of demonstrative evidence, trial exhibits, trial boards, scale models, courtroom animation and trial director generated visuals are used to increase the likelihood of winning cases. 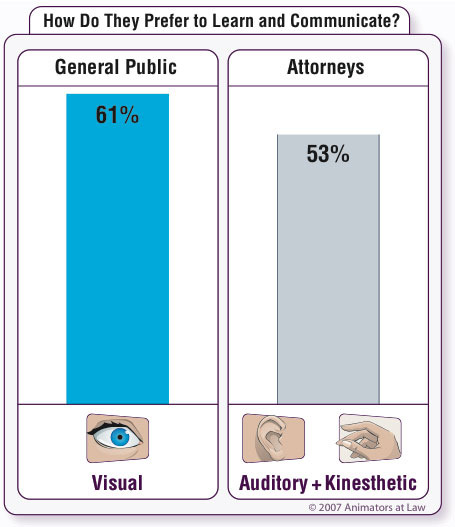 Visual aids help win cases for many reasons including 1) nearly two-thirds of jurors (and many judges) are visual learners who process visual information far better than information delivered orally; 2) people forget most of what they hear; 3) visual aids simplify cases and speed them up; 4) visual aids are known to increase persuasion. Below are 6 studies and articles that support the science behind using litigation graphics and visual aids of all types in courtroom presentations. The Wechsler Memory Scale (1946): First developed in 1946, this standardized measure of memory has come to be used to measure everything from the progression of Alzheimer's to juror memory and retention. It has been used to authoritatively show that people quickly forget about two-thirds of what they hear. Many studies draw similar conclusions. The Persuasive Effect of Graphics in Computer-Mediated Communication (1991): Those exposed to graphics are more persuaded to act than those who are not. The test constructed here was whether graphics (either static or dynamic) made someone more inclined to pledge a donation to their alma matter than someone who was exposed to only text. Broda-Bahm Study (2011): We referenced this study in a previous article. It found that an immersive (as opposed to an occasional or absent) use of graphics during courtroom presentations yielded the best results. One cautionary note about vaguely cited studies and especially the often cited 1992 Weiss-McGrath Report courtesy of Pepper Hedden, a detail-oriented reference librarian in the New York County District Attorney's Office [pdf pp 27-30]. The results of the Weiss-McGrath study are impressive - a 650% increase in juror retention when oral and visual evidence are combined. Many in the courtroom presentations business have cited this study for decades. Google returns millions of results for it. However, it turns out that the study does not actually exist. Rather, in 1992 an article was published in the ABA Journal which cited this study. Weiss and McGrath did write an article in 1963 that mentioned similar results, but they were quoting an 1856 internal corporate presentation and not a study at all. The 1856 reference does in fact note that a study was done, but it is not cited. Please post links to additional studies and references in the comments section below. Your email address is never shown, published or used, and you do not need to enter your full name.